On a sunny afternoon in the fall Melissa and I found ourselves outside, sitting at a black metal table with a red umbrella, and discussing ideas for “Cultures of Jackson.” As I perused through the calendar looking for some hidden inspiration, my eyes fell upon the dreaded finals week in December, but something else also caught my eye. With a mischievous grin I looked up at Mel and said, “Hey . . .did you know Hanukkah is in December this year?” Unfortunately my partner in crime was plagued by a persistent illness and could not pursue this particular adventure. Nonetheless, our beloved photographer Sol Bee and her assistant Noemi were able to accompany me. David Cohen, the president of the congregation, invited us to attend the final events celebrating Hanukkah at B’nai Israel, the local Jewish synagogue. According to David, the building was established in 1941 and is on the National Register of Historic Places. The congregation itself has been around much longer. In fact they just celebrated their 130th year anniversary this year. The three of us walked down the stairs into the building, and a small group of people greeted us. After asking around I quickly realized that the majority of people in the room were either children of converts to Judaism or converts themselves. Entering the kitchen I met Hannah Clayton, a tall woman with dark, kind eyes, who was wearing a floral-pattern apron. 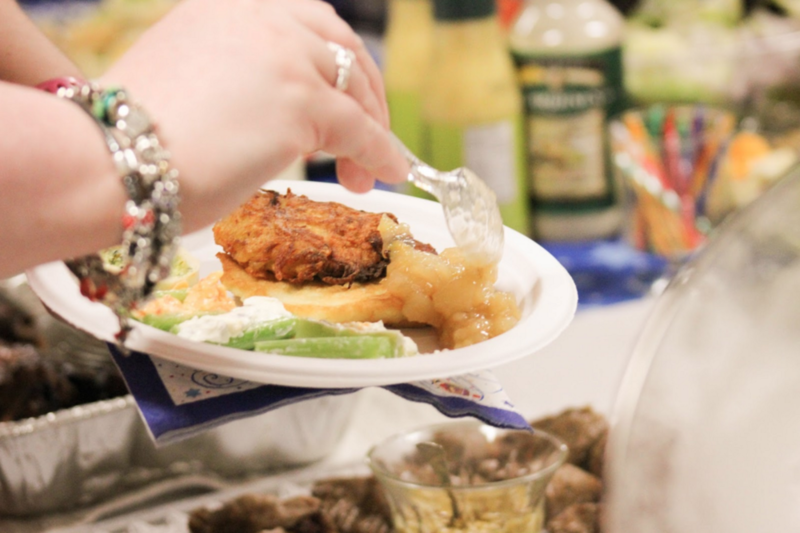 She showed me the Latkes, a traditional Hanukkah food, which was floating a deep cast-iron skillet. “It’s actually more like a hash brown than anything else,” she said as she described the large clumps consisting of finely shredded potato mixed with egg, onion, and a bit of salt. When she informed me that they were served with sour cream and homemade applesauce, I must admit that I was a bit skeptical, but more on that later. Through the course of the evening Sol Bee, Noemi, and I met Rabbi-Cantor John Kaplan, a man of cheery disposition with round-rimmed spectacles and a greyish-white (my father would say “arctic blond”) beard. The title Rabbi indicates that he is a spiritual leader; Cantor means that he is also a leader of music. Several members of the congregation repeatedly told me they were extremely blessed to have a man who could provide spiritual guidance as well as musical leadership. This man never stopped smiling as he told me the story of Hanukkah (or Chanukah)—a story which began in the time of Alexander the Great. By 167 B.C.E, Greek Syrians were in the process of conquering the Land of Israel—a conquest which involved a rather strong infusion of Greek culture. A particular group of Jews, known as the Maccabees, refused to conform to the cultural norms being imposed on them. According to an article I found, the Greeks further “intensified [their] campaign by defiling the Temple in Jerusalem and banning Jewish practice.” This atrocity sparked a three-year revolt, which, in the end, culminated in the Jews rededication of the temple of old. However, after such a chaotic season the menorah (a temple lamp that is never supposed to go out, also the name of the specific candle holder used for Hanukkah) had only enough oil for one day; the rest had been desecrated by Greeks. Miraculously the oil in the menorah lasted eight days, the number of days it takes to make fresh oil, and never went out. It should be noted that the Jews do not celebrate this holiday because of the military victory; they celebrate it because of the miracle. The Rabbi-Cantor did not even mention the retaliation of the Jews; I learned this information from internet sources. Interestingly the same source pointed out that “Jews do not glorify war”—an admirable quality espoused by Rabbi Kaplan. The rest of the congregation slowly filtered in. The small group of people well acquainted with each other produced a relaxed, home-like environment. As we waited for dinner I met Jo Anne Smith, who described herself as “a gentile friend of the congregation,” saying that B’nai is very dear to her. The two of us chatted rapidly until Rabbi Kaplan announced dinner with the breaking of a woven loaf of bread. Jo Anne later told me that the crossed sections of the bread represent a person who crosses their arms and refuses to work; it serves as a reminder not to work on the Sabbath. After filling my plate with food, Latkas included, I sat at the table and stared briefly, contemplating the foreign food with sour cream and applesauce. My minor skepticism at the combination of potatoes, onions, sweet apples, and sour cream still remains. However, after tasting it I eagerly glanced back at the potluck line to see if there was going to be enough for seconds. It was really good! Seated at our table was Bethany Berger. A recent college graduate, she is doing a fellowship with the Institute of Southern Jewish Life (ISJL) and just happened to be in town for the holiday. 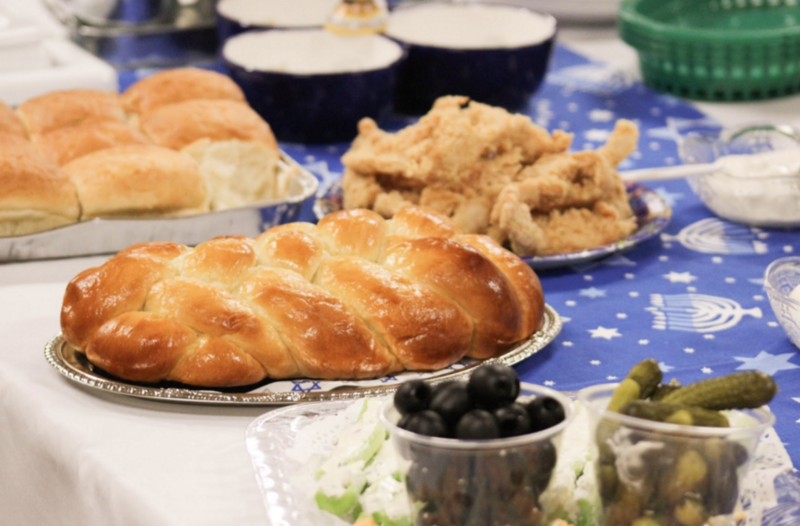 ISJL works out of Jackson, Mississippi, but reaches Jewish communities all across the Southeast—from northern Virginia to western Texas—hosting cultural events, giving rabbinic services, and providing educational resources. Bethany and Kelly, a college student in the process of becoming a Jewess, guided us through the evening and answered our many culture questions, particularly about the dreidel. Dreidels are square spinning tops with four Hebrew letters, one on each side, used for a game. In the diaspora, the letters nun, gimmel, hey, shin, stand for Nes gadol haya sham, a Hebrew phrase meaning “A great miracle happened there.” Interestingly the letters on the dreidels in Israel differ slightly, so that they stand for the phrase, “A great miracle happened here”. These small wooden objects were scattered over the tables as decoration. According to the two women, Jews used the dreidels to fool the Greeks, who supposed them to be playing a game instead of studying the Torah, which was forbidden. Towards the end of the evening, a girl invited me to play the game with her and two others. Let’s just say luck was not on my side, and I lost a lot of chocolates, the choice gambling chips of the night. Light one candle for the Maccabee children - give thanks that their light didn’t die. Light one candle for the pain they endured - when their right to exist was denied. Light one candle for the terrible sacrifice - justice and freedom demand. Light one candle for the wisdom to know - when the peacemaker’s time is at hand. Don’t let the light go out - it’s lasted for so many years. Don’t let the light go out - let it shine though our love and our tears. Light one candle for the strength that we need - to never become our own foe. Light one candle for those who are suffering - the pain that we learned so long ago. Light one candle for all we believe in - let anger not tear us apart. Light one candle to bind us together - with peace as the song in our hearts. What is the memory that’s valued so highly - that we keep it alive in that flame? We have come this far always believing - that justice will somehow prevail. This is the burden and this is the promise - and this is why WE WILL NOT FAIL! Now, several days later, I am sitting in my living room contemplating the event. In front of me is a short, squatty Christmas “shrub” (because it’s definitely not a tree) that my roommate fondly calls “The Fat One.” Gazing at this little plant glowing with Christmas lights, I can’t help but make some connections. Upon returning from the small Jewish congregations of Jackson, I began doing some research and discovered that Hanukkah is also entitled the Festival of Lights. Ironically Diwali (the Indian holiday Melissa and I covered last month) is also known as the Festival of Lights, and Christians say they are celebrating “the Light of the World” at Christmas time. It seems all three of these religions could relate to the second verse in Peter Yarrow’s work: “Light one candle to bind us together with peace as the song in our hearts.” I suppose I have been caught in the mystery of light, a mystery that is apparently celebrated by many differing cultures in a variety of ways. But we all agree on one thing: that the light is good, and that goodness must be brought into the world. Y’all have a Merry Christmas, a Happy Hanukkah, and a wonderful New Year!